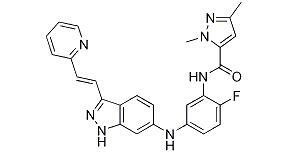 Remarks:SU5402 is a multiple target inhibitor of VEGFR2 (Flk-1/KDR) and FGFR1 (IC50 at 20 and 30 nM,respectively). This agent inhibits PDGFRβ and EGFR with IC50 values of 510 nM and > 100 μM, respectively. SU 5402 inhibits tyrosine phosphorylation of VEGFR2 and PDGFR in NIH 3T3 cells with IC50 values of 0.4 and 60.9 μM, respectively. This agent inhibits embryonic left-right determination and exhibits potent anticancer activity in vitro and in vivo.